Are you in need of a commercial garage door at your Burnsville, MN, company? Plenty of business owners spend a lot of time researching a reputable company to complete installations, inspections, maintenance and repairs — for good reason. Your garage door is a huge investment, and it makes up an important part of both the look and productivity of your building. Luckily, you can trust O&L Door Systems as your full-service provider. We’ve been serving businesses in the area for more than 20 years, so we consider you a neighbor and friend from square one. Step one is installation. Maybe you’re a new business owner who just moved into a shop to start operations and you need to choose the right door to get the job done. 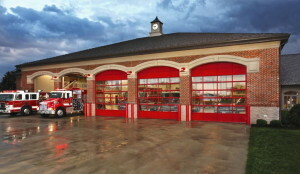 You might also be in charge of a fire station, or an owner of a restaurant, car dealership or other facilities that just moved to a new building and needs a door update. No matter what your circumstances are, we’ll work with you to find the perfect durable, stylish, quality Clopay® garage door from our inventory with the exact size, look, features and specifications you need. Warehouse doors that are perfect for large storage facilities. They come with roll-up or swing-open functionality, depending on your preferences and business needs. Coiling and fire doors that are durable and code-compliant to keep your facility as safe from hazards as possible. High-speed doors for firehouses, police station and other locations with professionals who need to be on the move quickly without a delay. Front entry doors that can enhance the aesthetics of any storefront or other location, attracting customers with a stylish, contemporary building. Commercial bi-fold doors that open in a unique upward fashion to allow for operation without much area obstruction. Commercial four-fold garage doors that function similarly to bi-fold doors, but operate faster and offer higher security. This option provides full visibility in many instances, which attracts customers and allows for smoother business operations. When a broken garage door could mean lost work hours, late shipping orders and other unacceptable situations, you need a company that can repair any unexpected damages as quickly as possible. Garage doors have countless moving components, and with the high-traffic use that typically occurs in commercial facilities, even the best door can break down sometimes. When that happens, you can call us 24/7. We’ll send a technician to your location day or night to inspect, diagnose and repair the problem, so you can avoid company downtime. Our crews stay up-to-date through ongoing training so they can complete repairs for any of the leading brands on the market, whether we installed the door initially or not. When you call us, we’ll come prepared. Our trucks are stocked with tools and equipment to fix almost any problem, so you don’t have to worry about back ordering parts and waiting longer for a repair. We’ll work within OSHA requirements to meet the strictest compliance standards, and we’ll answer any questions you have throughout the entire process. At O&L Door Systems, we provide preventative maintenance on a regular schedule to keep your door running smoothly and save you money. Inspections and annual tune-ups keep your garage door at its best performance throughout the year. They also allow us to spot wear-and-tear early, before it does additional damage to your system and creates the need for more expensive replacements. Reach out to us online today for quick, quality garage door services that boost your business’s productivity and, ultimately, profitability, or call us at (612) 623-1817.